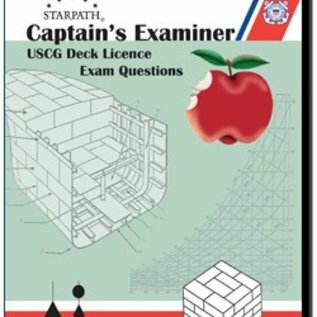 Captain's Examiner, nine thousand practice questions presented in the Starpath Examiner module. CD-ROM. 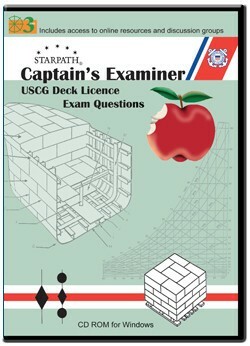 This product presents some 9,000 USCG questions used in USCG deck license exams, along with all of the related graphics. The graphics can be zoomed and panned to study details. The questions are presented in several categories: Navigation Rules, Deck General, Navigation Problems, General Navigation, and Safety. The questions are presented within the Starpath Examiner module, which allows users to select and filter the question database to meet their study needs. From any general topic, you can select out questions that match keywords of your choice. This filtered out pool of questions can then be filtered a second time for even more specific organization. Then select the number of questions per test and the type of scoring (percent of test or percent of answers). All results can be saved, so on subsequent practice tests you can limit the questions to ones missed on the first test. If a question contains a diagram, that diagram will appear automatically in a separate window at the click of a button, and the diagram can be zoomed or resized for convenient display. Many of the diagrams are very complex, and with this option you can study the illustrations in whatever detail is needed. There is also an option for sorting (tagging) any question into two categories for subsequent study. One application of the tag scheme is to mark the "easy" ones that you do not want to ever see again, and the "hard" ones that you will want to come back to at some point. As long as you save your results at each practice test, you also maintain knowledge of which ones you missed and which you got right during a practice test.